What are your favourite food-related items of 2010? As I realized my blog is just over a year old (December 23, 2009 was my first post), I decided to jump on the bandwagon with my own year-in-review. This post is on 2010’s top posts, photos, and favourites, plus trends for 2011. According to site stats, my most popular posts are unexpected – at least, by me. 5. My adaptation of Peter Reinhart’s Multi-grain Bread. Have you ever tried authentic Chicago pizza? There are three varieties, in case you were wondering. I spent my first three decades living within minutes (no more than a half-hour) of the very best pizza parlours in the Greater Metropolitan Chicagoland Area. I sampled all the top-rated pizza places. So I feel qualified to “splain” it all to you. The first is a thin-crust pizza, which is often more chewy and thicker than the New York version (much more crisp and almost cracker-like in consistency); it is most similar to the original Neapolitan pizza crust but is really an American interpretation. In my youth, I do not remember any authentic wood-burning oven pizzas, comparable to their ancestors in Naples, but today there are many restaurants offering this kind of “real” pizza. I believe the stuffed pizza became popular in the 1970s, a decade not known for its restraint. After all, wretched excess was in vogue. Think disco! Think glittery body-clinging polyester fashion! 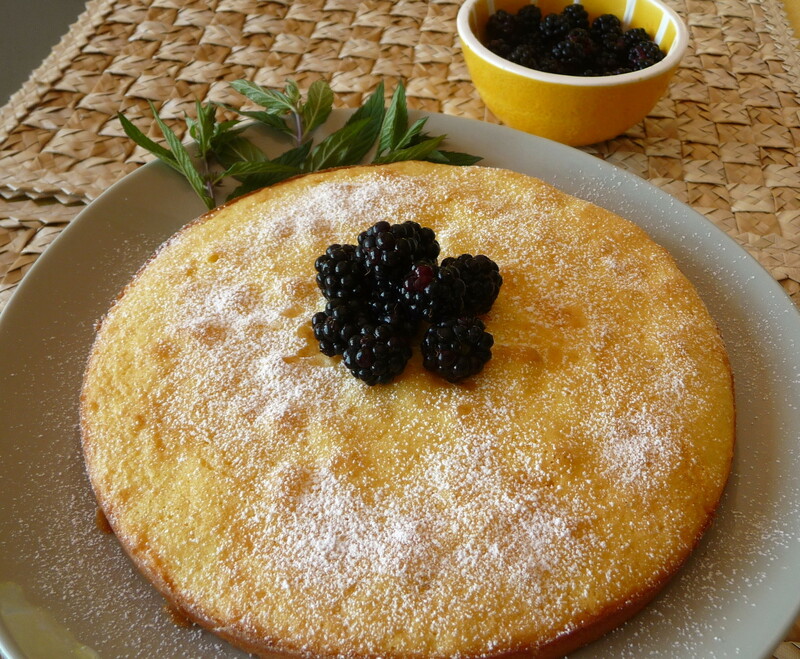 Think ultra-rich high-fat desserts! 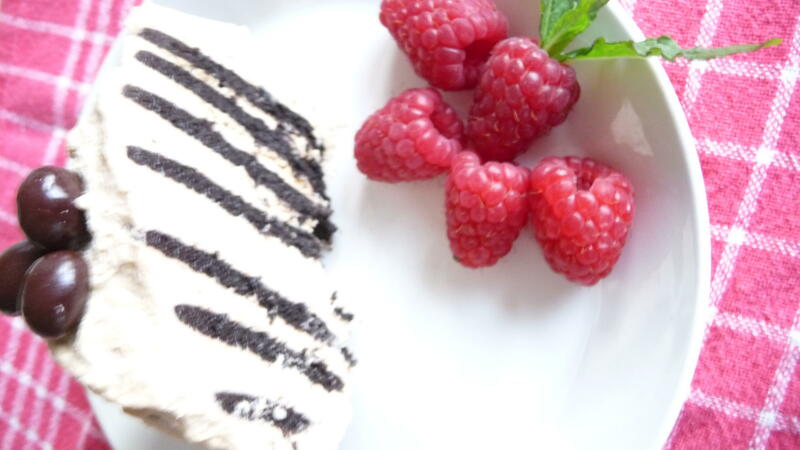 It was the era of chocolate decadence cake and appetizer buffets showcasing nothing but cream-cheese dips. I remember sampling all the varieties at Arnie’s Restaurant in Chicago – chocolate-chip, cinnamon-raisin, honey-walnut, and some savoury counterparts – all cream-cheese extravaganzas. I assure you I am not hallucinating, due to other 1970s excesses. In Chicago, the deep-dish pizza is a World-War-II-era invention of Ike Sewell. Mr. Sewell started Pizzeria Uno around 1943 at Rush and Ohio Streets, on the city’s near north side. The pizza was an immediate hit. He opened a second location, named strangely enough, Pizzeria Due, just a block away in 1955. Both are still vibrant pizzerias. (Mr. Sewell also introduced upscale Tex-Mex cuisine to the Midwest of the US, where it had been unknown, through his restaurant Su Casa in 1963). 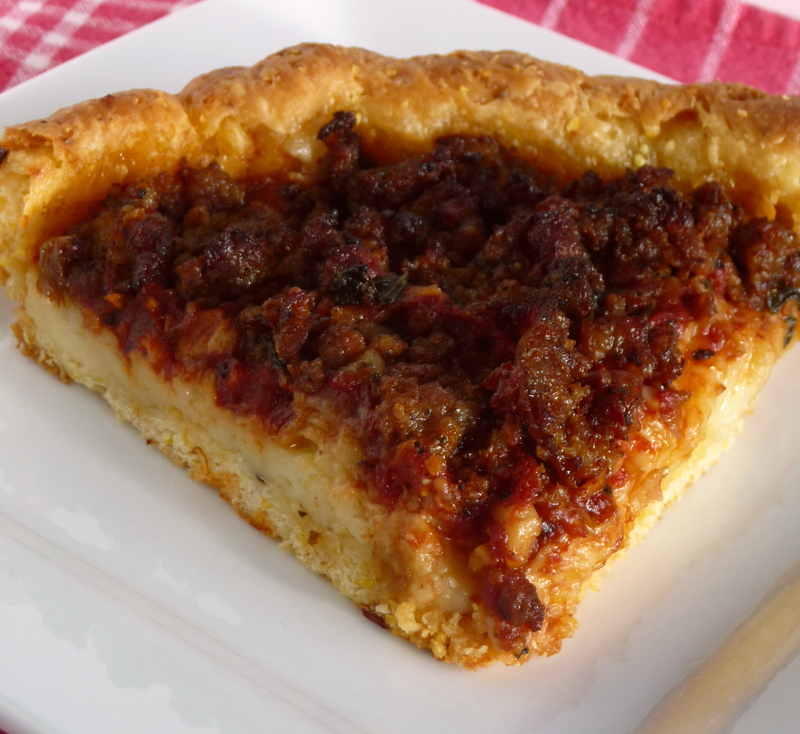 I will be posting the outstanding America’s Test Kitchen recipe for Chicago-style pizza (above), which I recently made – very authentic and worth the extra time to prepare the buttery crust. 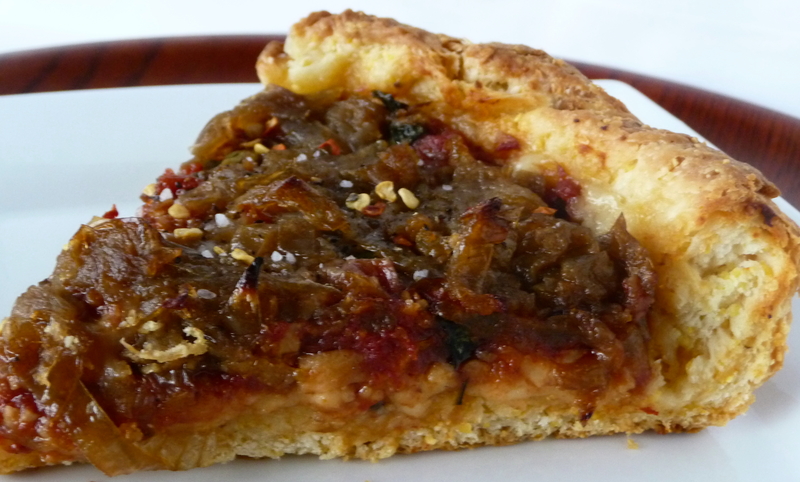 The recipe features an authentic tomato sauce and makes two pizzas. 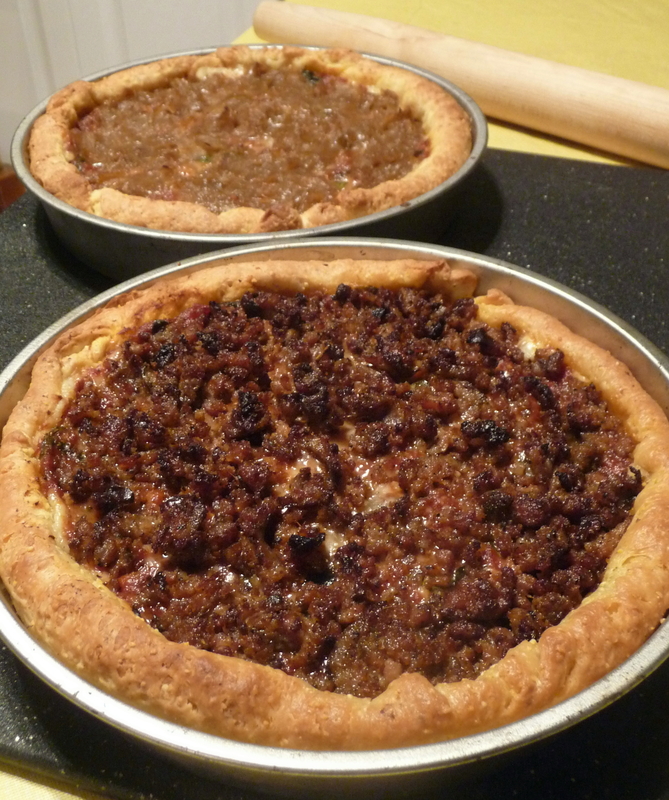 My versions were a hot-hot-hot chorizo (above) and a pizza with caramelized onions. While I was in Chicago three times this year, this is the first time in my life in which nobody in my immediate family is living in the Greater Chicagoland Metropolitan Area (TV slang for the vast reaches of the city into suburbia and beyond). My mother is now in an assisted living facility near my brother in Connecticut. So maybe this is why I have been craving Chicago specialties, including the famed Italian beef sandwich, which I shall make in my slow-cooker this weekend. The deep-dish buttery-crusted pizza and the Italian beef sandwich are perhaps the two finest exemplary Chicagoland dishes, originating in the city yet gaining renown elsewhere. 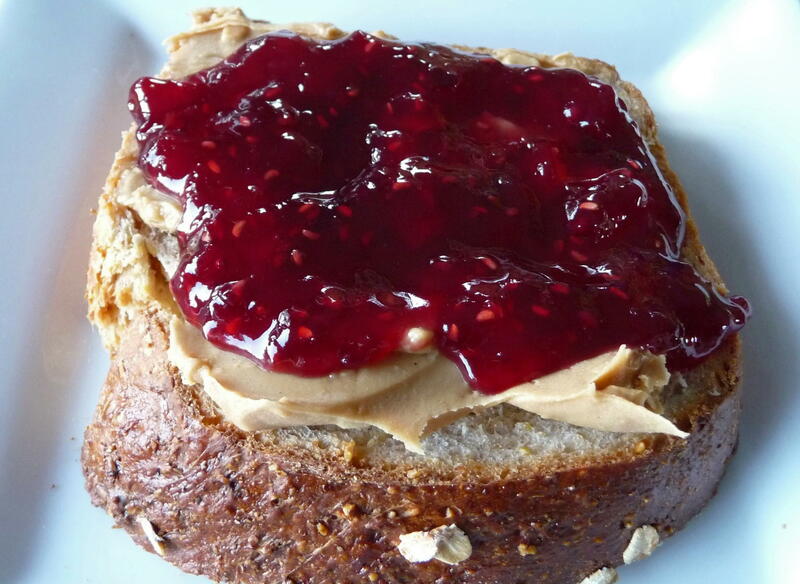 Stay tuned for Chicago specialties…. In case you had no other meal plans, tomorrow is another odd day for you to celebrate in the Wacky World o’ Food Holidays. Roast suckling pig, anyone? The holidays on the 23 and 24 make more sense than Xmas itself, as I associate pumpkin pie with Thanksgiving, but who knows who is responsible for anything on the list, to begin with? Today we celebrate National Chocolate-Covered Anything Day. Did you know about this holiday? I find it a bit odd – chocolate-covered ANYTHING? – really? ?It is worthy of celebrating, nonetheless. 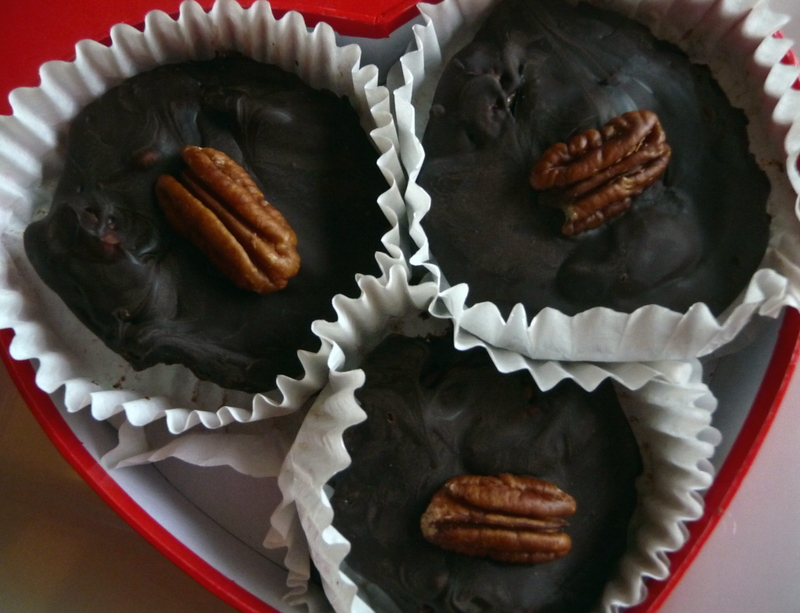 Just in time for the bigger “holiday season”, the recipe I have chosen to honour this day is home-made “turtles” or chocolate-covered salted caramels with pecans (caramels au fleur de sel aux pecanes et chocolat, if you want to sound fancy in some non-Francophone milieu – and, if you are unfamiliar with the term, I do not mean someone named Frank on the phone but speakers of French). I noticed on a trip to France a few years ago that caramels with fleur de sel had become very popular. It must be the combination of contrasts, between the caramel’s rich sweetness with the fleur de sel‘s saltiness (mais, oui!) 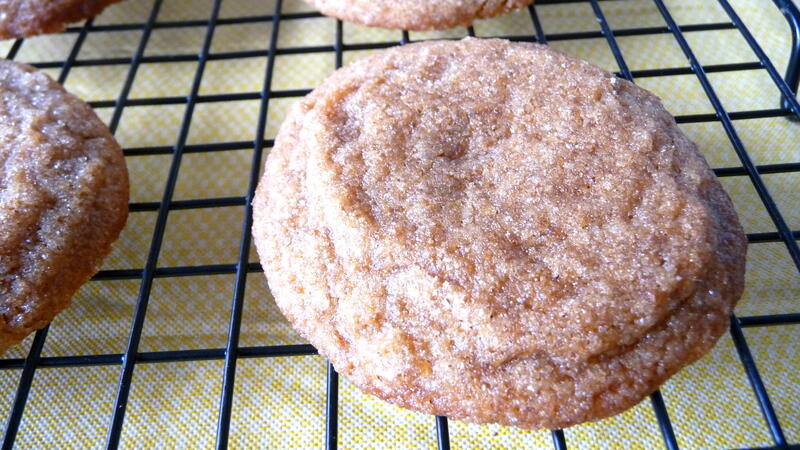 as well as the caramel’s thick-creaminess with a bit of crunch from the salt. The fleur de sel makes me think of crack cocaine, which I believe looks like white crystalline chunks – not entirely unlike clumps of the French sea salt – and fleur de sel makes the caramels absolutely addictive. Thus, when I found a recipe for soft salted caramels from the fine Canadian food writer Lucy Waverman a few months later, I needed to try it. Lucy had adapted a recipe from the great Jacques Pepin. It is easy enough to make if one has a candy thermometer and can follow directions precisely. 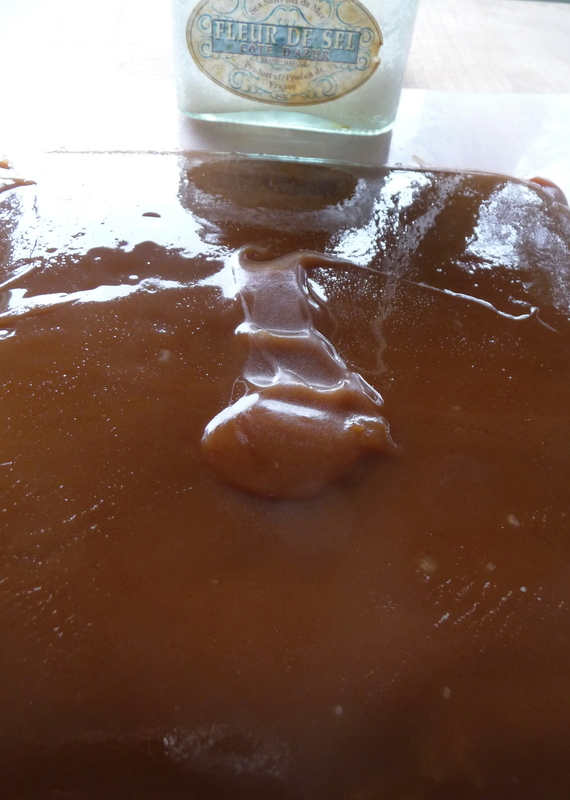 I had never made caramels before but found the recipe straight-forward, simple, and fun, though requiring a bit of time and one’s attention. But it is worth the effort. For the inspiration – and the recipe, keep reading. 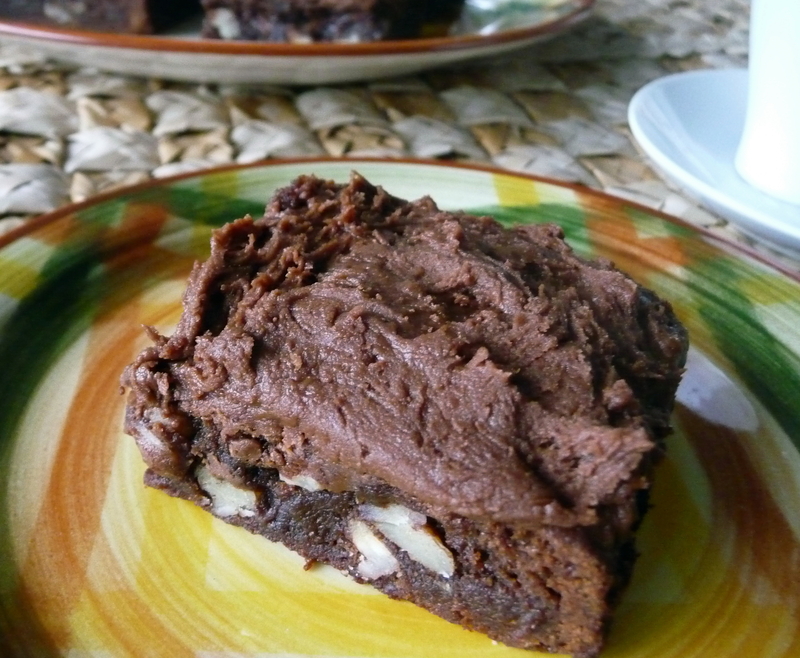 Did you know that today is National Chocolate Brownie Day? While I have no idea who proclaims such things, it is still cause for celebration. 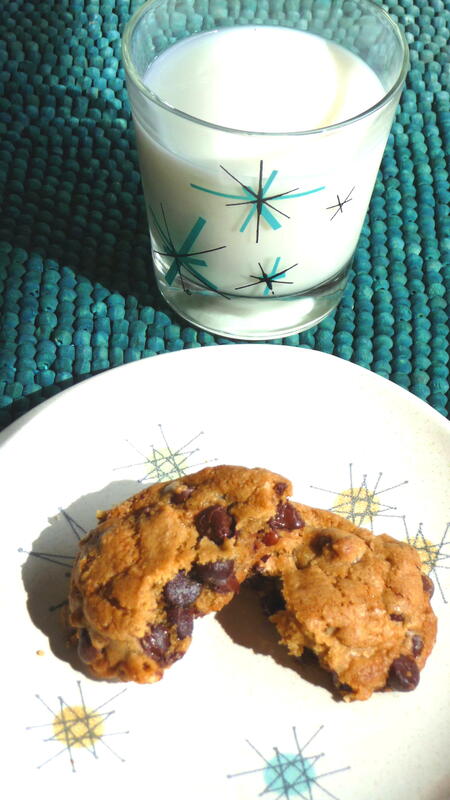 To mark this momentous occasion, I finally tried a recipe I have wanted to make for some time – one which is purported to be the very first. The earliest published brownie recipe was in the 1897 Sears, Roebuck catalog, and its name, for that reason, is simply “1897 Brownies”. I came across this in Food: True Stories of Life on the Road, edited by Richard Sterling. This is a wonderful collection of short essays on food experiences and explorations around the world. The recipe followed a charming story of a young American woman who started a covert brownie business in Glasgow, Scotland in the 1970s. I read it before our recent trip there, and I thought I might stumble upon a Scottish brownie somewhere. While I did discover millionaire’s shortbread, there were no brownies to be had in Scotland (“nae brunies”…). 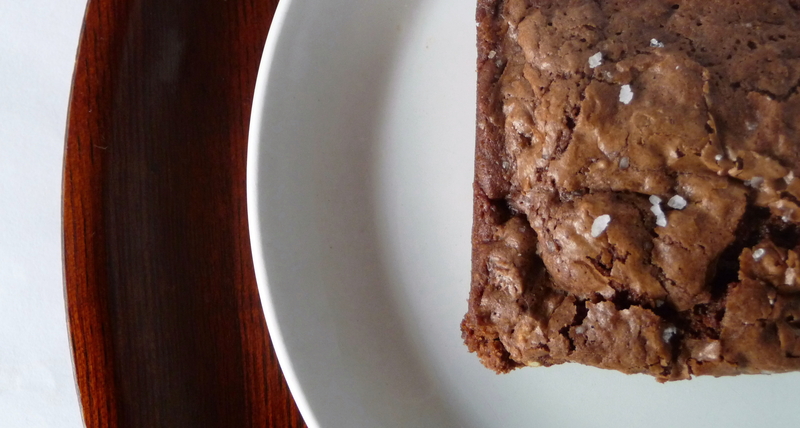 This recipe is fascinating – not only because it could be the original brownie – but it also has no butter. (There is an alternative to using unsweetened chocolate, which includes cocoa and a modest amount of butter). 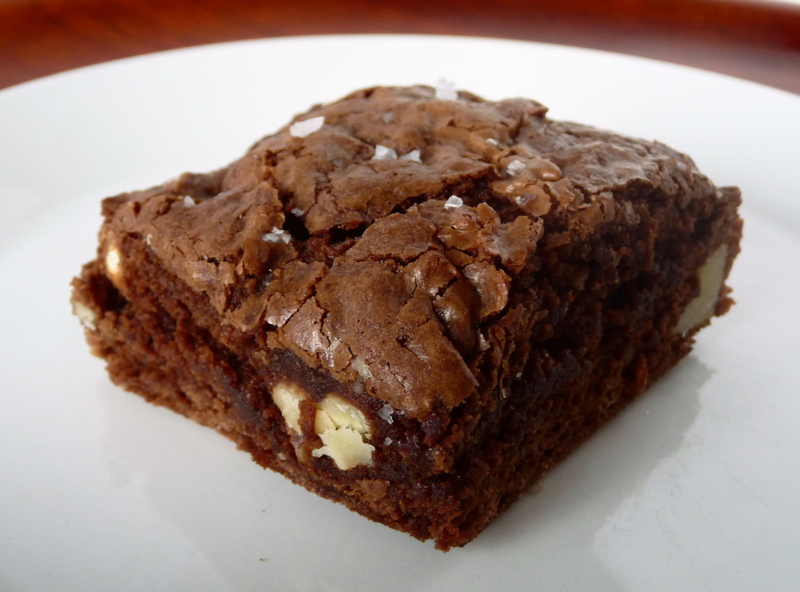 Thus, it is a lighter, lower-fat brownie. In fact, as National Brownie Day coincides this year with the last night of Chanukkah, it could be a good follow-up to the oil-laden or dairy-rich foods of the holiday. 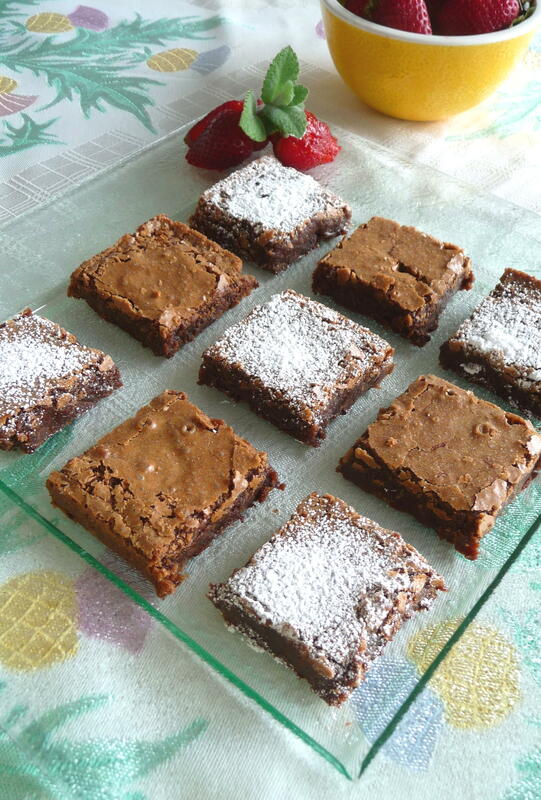 The 1897 Brownie could be a good holiday treat for Xmas or New Year’s, as well.